Thursday, March 8, the A.P.E.X. Event Series presents author, playwright/filmmaker, and human rights activist Jen Marlowe. 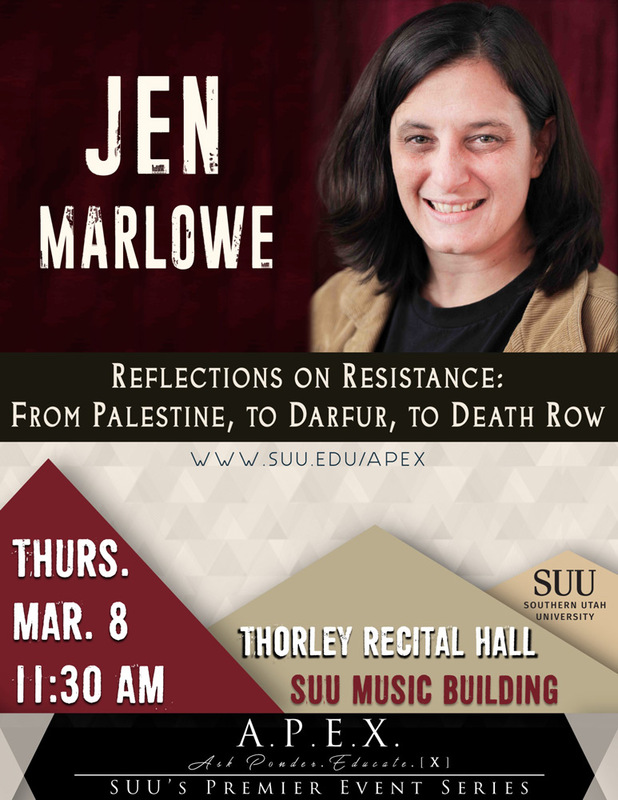 Marlowe will be presenting on her work on human rights while researching and documenting in Palestine and Darfur. Her presentation will begin at 11:30 A.M. The presentation will take place in the Thorley Recital Hall in the SUU Music Building and not in the Hunter Conference Center where the usual APEX events are. This will be free and open to the public. Based out of Seattle, Washington, Jen Marlowe began her work by working at the Seattle Children’s Theater. Her work’s mission from the beginning has always been focused on bringing stories of individual people to life. Jen has worked with youth from Afghanistan, Cyprus, India, Pakistan and Bosnia-Herzegovina, and this work ultimately became the motivation for her to pick up a camera. Since 2010 Ms. Marlowe has created and maintained Donkeysaddle Projects. This organization “highlights the people's resilience, courage, and the vital needs they are fighting for.” Donkeysaddle Projects is responsible for the making of various documentaries including: Witness Bahrain, Rebuilding Hope: Sudan’s Lost Boys Return Home, Darfur Diaries: Message from Home, and Inside the Culture of Resistance. Marlowe has authored and co-authored the titles, I am Troy Davis, The Hour of Sunlight, and Darfur Diaries.